Let me start off by saying that I am not a big Adam Sandler fan. But this movie was hilarious. 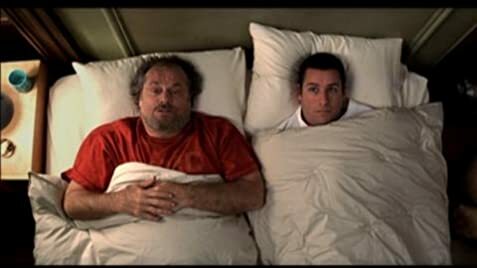 Nicholson and Sandler work very well together. John Turturro as usual plays his part well as Chuck. How every Jack Nicholson is his usual psycho funny self in this movie. Pushing the envelope so far with Sandlers character Dave Buznik. 1 hour and 41 minutes passed like the wind. Adam Sandler donated copies of this movie to U.S. military bases supporting Operation Enduring/Iraqi Freedom in the Persian Gulf as soon as it was released. The donated version contains a five-minute introduction by Adam Sandler, who personally thanks the troops for what they are doing. In Yankee Stadium, when Dave attempts to run out and take over the P.A. microphone, the mic shown on the stand is a popular news mike - an Electro-Voice 635 - a wired mike, with no cord plugged into it. However, when he actually gets out there, and takes the mike off the stand, it's a Samson wireless mike, with the little antenna sticking out the back. Our thoughts and prayers go out to LYNNE THIGPEN and her family. She was a great actress and a great lady. In the French version, instead of Geraldo Rivera that Chuck is going to go after, he says Mike Tyson.